A case study from Brett Martin daylight systems. For leading supermarket retailer Waitrose, thermal efficiency and long term performance were crucial elements during construction of the company’s first national distribution centre. As part of a highly innovative building envelope, 13,000m2 of Energysaver GRP composite rooflights from Brett Martin Daylight Systems were specified to bring maximum daylight into and reduce energy demands at the flagship Magna Park in Milton Keynes. 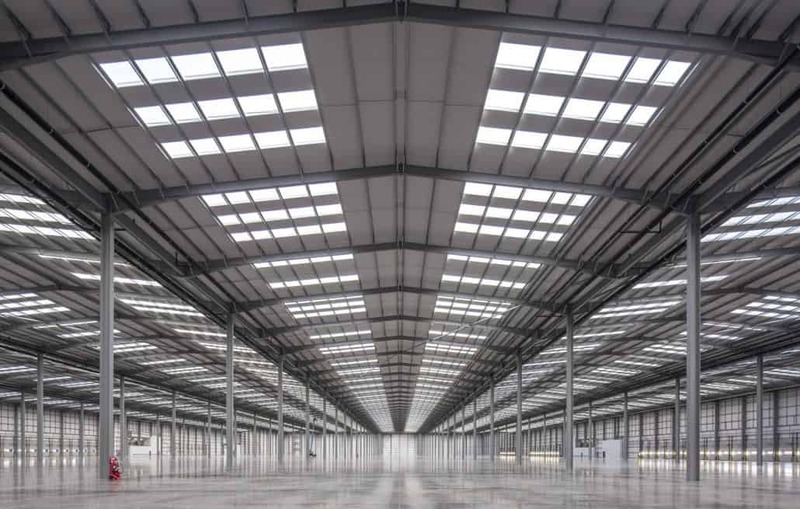 Developed by IDI Gazeley and built by McLaren Construction to achieve a BREEAM rating of ‘Excellent’, the giant new distribution centre includes a 940,000 sq ft roof, 15% of which is made up of Energysaver rooflights. Working closely with supply chain partners, Kingspan, Premier, SFS Intec and Brett Martin, full envelope contractor FK Group carried out extensive testing at pre-construction stage to challenge industry best practices and ensure the most efficient fixing techniques. As a result, an entirely new method of fixing both Kingspan composite panels and the Energysaver rooflight units was developed to deliver maximum airtightness and minimise any risk of water ingress. Widely specified in warehouses and industrial facilities, the insulated roof panel system and rooflights were then systematically installed by FK Group in a fast-track nine week programme to achieve exceptional airtightness and extended building lifespan. On completion, an airtightness test demonstrated that the building achieved a result of 0.51 m3/hr/m2 – exceeding the original challenging target of 1 m3/hr/m2 and the best practice of 3 m3/hr/m2 required by Building Regulations Part L2A. Based on this expected performance, the building will achieve operational savings in the region of £7,500 and 39,000kg of CO2 per year – equating to a £222,000 cost saving over its lifetime. Brett Martin’s Energysaver composite panel rooflights are innovative triple skin factory assembled insulating rooflights (FAIRs) for composite roofs manufactured from GRP. Designed to the same depth as the composite roofing system, Energysaver’s flat liner panel sits flush with surrounding metal panels for excellent aesthetics and a neater internal appearance. Delivering U-values from 1.9W/m²K down to 0.9W/m²K, they offer high quality diffused natural daylight, thermal performance and ready-to-fit convenience for wide-span buildings. The specification of Brett Martin’s Energysaver composite panel rooflights also helped FK Group to meet the client’s criteria for an extended warranty. As the building lease is divided into two 15 year periods and not the standard 25 years, the increased thickness of the rooflight offered FK Group additional flexibility to deliver improved life expectancy and minimise maintenance requirements over the building’s lifetime. With its ground-breaking new distribution centre, Waitrose has created a state-of-the-art facility from which the company will distribute 25,000 product lines to 317 branches nationwide. The Energysaver rooflights at Waitrose were specified to offer a 30 year durability warranty meaning the vast internal space of this landmark building will be flooded with natural light to improve the internal appearance and working environment for many years to come.